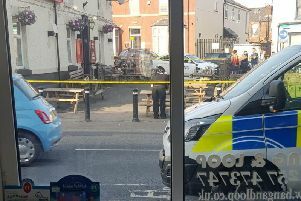 A man has tonight been charged with murder after the death of a man in a Hindley pub. Police said Derek Bentham, 46, of Smithwood Avenue, Hindley has been charged with the murder of Lee Christy and remanded to appear before Wigan Magistrates Court tomorrow, Thursday September 20. Meanwhile, hundreds of well-wishers have left tributes to the man who died and floral dedications have also been left outside The Bear’s Paw, in Hindley, for 45-year-old Mr Christy, who was hospitalised on Saturday. Mr Christy remained in a critical condition before it was reported on Tuesday afternoon that he had died. An appeal for anyone to come forward, who saw anything leading up to the assault, which took place just before 11pm, has been reissued by senior police. His daughter Leah is among those who have paid tribute to Mr Christy and others have posted messages on the Wigan Today Facebook page. Angie Moss posted: “Absolutely devastating news for this family. “A young man’s life taken all for the sake of stupidity." His death is the second associated with a pub in Hindley this year, after Nicholas Sullivan lost his life during a confrontation in Georgia Brown’s last January. Craig Cropper was jailed for four years and eight months at Bolton Crown Court after pleading guilty to the manslaughter of Mr Sullivan, popularly known as ‘Baggo’. The victim had been out commemorating the anniversary of his mother’s death when he was levelled by a volley of blows from the powerfully-built Cropper. Several people have raised concerns about the drinking culture in the Hindley area, in the wake of the deaths. Jason Winstanley posted: “This is happening way too much in Hindley! Donna Marie posted: “So sorry for all the family. Hindley is horrendous and getting worse. Witnesses can call police on 0161 856 2491, quoting incident number 2245 of September 15, with fresh information.